Engagement wishes from the heart! When a friend announces their engagement, you immediately reply with 'Congratulations!' and 'I'm so happy for you!' engagement wishes. Normally, that is all you would do. Unless the couple has an engagement party, gifts are usually not given for engagements... but you're so excited for them you want to celebrate and show them in your own unique way. You want to express your feelings with more than a simple "congrats". You want to really show your friend how glad you are that they've found their special someone. The one person they want to spent the rest of their life with. Some occasions are easier to buy for than others. Even if the person you are buying for has every toy and gadget every invented, you can always find something to give. Gift cards are great for these types of people. But, a gift card just wont truly express uniqueness. Not only does a gift card not tell the person you think they are special, it might tell them you felt like you had to give something; gift cards are a quick and easy solution to your gift giving dilemma. Nobody wants a "forced" gift. A newly engaged couple will always prefer to get nothing at all than a gift that clearly shows you felt like you had to give something. So, what to give? What kind of gift will express how you feel? Do you buy a combined gift for the couple to share? Do you buy something just for her or just for him? Unless you have an equally close relationship with both of them, you will probably want to get something for the person closest to you. It is not customary to give a gift to the groom-to-be, but traditions change all the time. If you want to give your best bud a unique gift to celebrate his upcoming wedding, go ahead. Now, you still have the problem of what to give. Something meaningful that won't end up the junk drawer right away. Or worse, get thrown in the trash. Captured Wishes has come up with the perfect solution – Engagement Wishes. 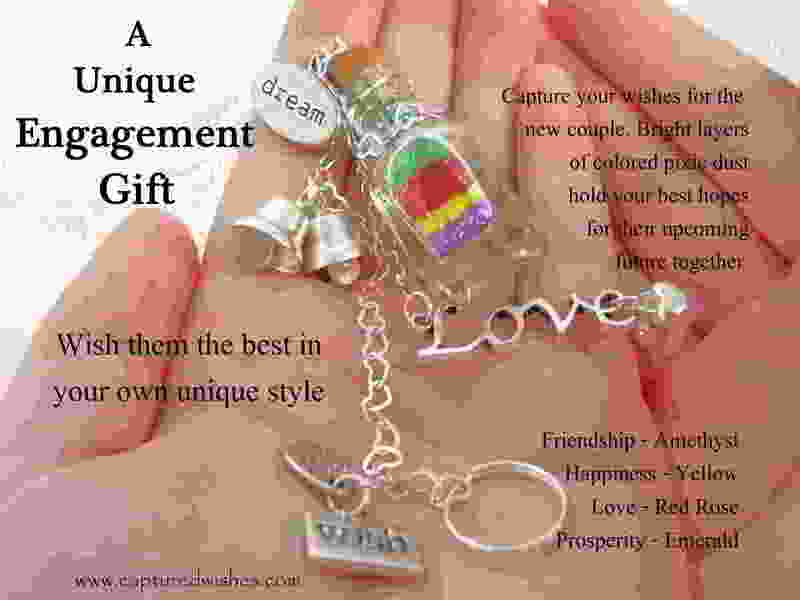 Each chic and unique engagement gift from Captured Wishes comes with a special verse designed specifically for the occasion. Whether you want to send special birthday, graduation, wedding, baby shower, sympathy or engagement wishes, these ultra cute wishes are the perfect choice. 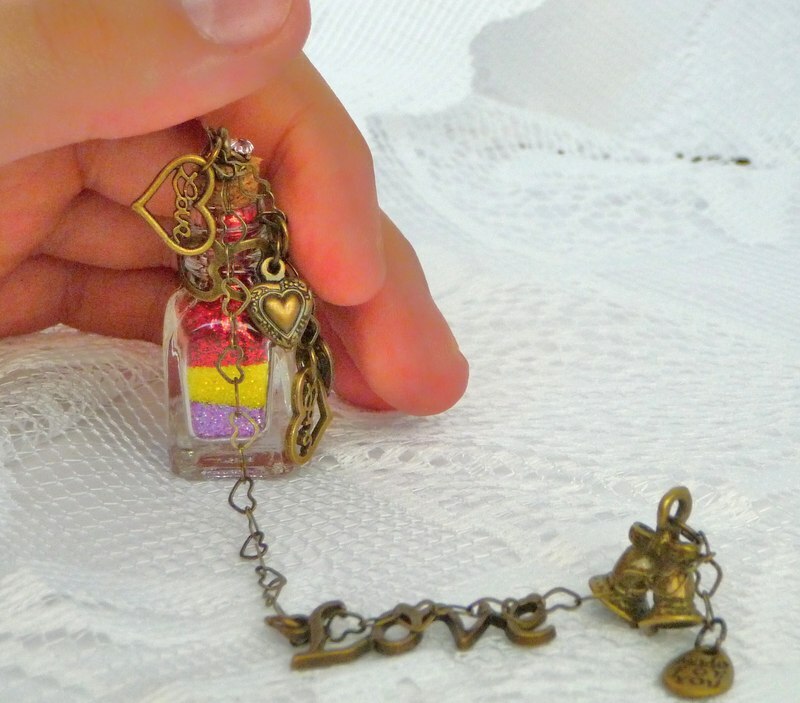 Captured Wishes gifts are chic glass bottles filled with magic dust of different colors which stand for singular wishes. And there are so many wishes that can be given; good luck (green) wishes, wishes for happiness (yellow), wishes for great friendship (lavender). So many feelings to express in beautiful and magical glitters! Nothing shows how much you care more than a bottle full of wishes. Your gift is securely packaged and shipped safely to your door. The unique style and elegance is certain to bring a smile to the faces of all who see this special gift. There they are - your warm-hearted thoughts and desires captured just for them! Just make sure to keep a record of where you found your special engagement gift. All of your friends are certain to be so intrigued with this magical vessel, they will want to give this chic and unique gift to all of their friends as well. The best part about a Captured Wishes gift is that it equally suitable for a male or a female, adult or child. It is also perfect as a couple's gift. As a gift all on its own, or as an additional gift combined with something else, Engagement Wishes will be loved and adored by all who see this fabulous magic gift. Bridal Wishes and Gifts Too!